Marine Corps parachute riggers are responsible for maintaining the equipment related to airborne operations. But that's just the start of their duties. 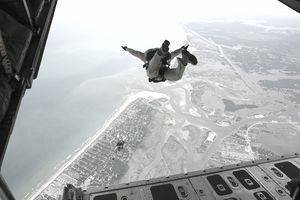 Parachute riggers, also known as airborne and air delivery specialists, undergo a wide range of training to perform parachute drop operations of personnel, equipment, and gear. They also are trained in equipment recovery operations using various slings and equipment securing gear. The job's official designation is Marine Corps Parachute Riggers (MOS 0451). Airborne and air delivery specialists are responsible for the maintenance of all life safety equipment relating to airborne or airdrop operations. In addition, they assist in preparing the supplies and equipment necessary to deliver personnel and equipment via parachute and conduct subsequent equipment recovery throughout the course of an operation. They are responsible for performing parachute repack as well as conducting preventive and corrective maintenance on all airdrop equipment. They also assist in evaluating proposed landing zones or drop zones in order to support the planning and execution of an airborne operation. They may perform various supervisory duties in support of airborne and airdrop missions. Must possess a GT score of 100 or higher. A GT score is a compilation of scores in military tests of communication skills and reasoning ability. Then there are the fitness tests that a Marine must pass in order to be a parachute rigger. First, the recruit must pass the U.S. Army Physical Fitness Test. The Army's physical fitness test is not the same as the Marine Corps physical fitness test. The Marine test requires pull-ups, crunches, and a three-mile run. The Army test requires a Marine in an Army school to complete push-ups for two minutes, sit-ups for two minutes, plus a two-mile run. Few Marines can't complete the Army test, but if you are not used to doing timed push-ups, you need to practice the two-minute test. The shorter run is only an issue for Marines who tend to pace their three-mile runs at a slower pace. They may need some practice to run the two-mile faster. But there have been Marines who failed the push-ups segment. Don't assume you can do two minutes of push-ups without practicing. Finally, you need to prove you can swim well. How well? The test is long and arduous. You have to walk in shallow water, then cross deep water for 40 meters carrying your full gear and weapon. You also have to jump into deep water with full gear and weapon, travel 10 meters, remove the pack, and swim 15 more meters dragging your pack and weapon. You also have to simulate an abandon ship technique by jumping into deep water carrying full gear and weapon, then travel 10 meters, remove the pack and swim 15 more meters dragging the pack and weapon. You will then repeat this, beginning with a jump from a greater height (about 10 to 15 feet above the water) and swimming 25 meters. Then, with full combat gear (but no pack), you'll swim 50 meters in deep water with your weapon slung, muzzle down. Assuming you get through all of the above successfully, you'll complete the Basic Airborne Course (BAC), at the U.S. Army Infantry School in Ft. Benning, Georgia. This is a three-week course during which you will undergo the Army fitness test. You'll also receive basic instruction in static line jumping from fixed-wing airplanes. The final step is the Parachute Riggers Course, held at the U.S. Army Quartermaster School in Ft. Lee, Virginia. Above information derived from MCBUL 1200.17e, parts 2 and 3.